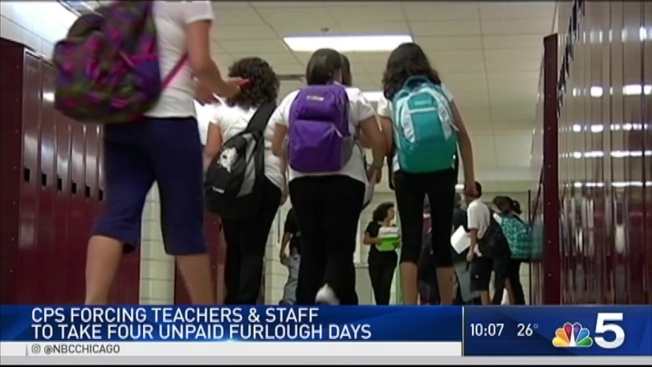 Staring down a $215 million budget hole it blames on the governor, Chicago Public Schools announced Friday it’ll make all staffers take four unpaid furlough days this spring on dates when children aren’t scheduled to be in class, the Chicago Sun-Times is reporting. The move, which CPS also imposed for three days last year to conserve cash, is estimated to save the state’s largest district $35 million. It’ll impact union and non-union employees alike who will be furloughed on February 3, April 7, June 21 and June 22. CPS banked on $215 million in pension money from Springfield that was allocated in legislation Gov. Bruce Rauner vetoed in December. The money was supposed to be tied to “pension reform.” But when a compromise couldn’t be reached, Rauner pulled the plug. District officials have said they’ll try to plug the funding gap in the least disruptive manner possible to schools, which have already seen their budgets slashed and their reserves spent during last year’s similar budget woes. Rauner spokeswoman Catherine Kelly chided CPS for budgeting money it didn’t have but said the governor would consider the legislation again if the General Assembly were to pass statewide “pension reform” measures. Last year, CPS also passed a budget it considered balanced despite banking on $450 million in pension help from state lawmakers. By January 2016, when that money hadn’t materialized, CPS cut school budgets for the second semester, too. It later furloughed employees for three unpaid work days. If principals hadn’t planned so carefully from the beginning of the financially-troubled year, teachers would surely have been among the 200-plus staffers cut in the middle of the school year. The Chicago Teachers Union is livid at what amounts to a 2 percent pay cut. “It’s the second year in a row they shortened the school year and cut our pay,” said Jesse Sharkey, the union’s vice president, angry that CPS leaders still won’t seek new revenue sources. Sharkey said the days off were to allow teachers to complete grades at the end of each quarter, work he assumes will still have to be finished and handed in. Meanwhile the ratings agency Moody’s advised that CPS shore up its finances with another property tax increase of $400 million, a notion district officials have rejected.